Dental emergencies never seem to strike at a convenient moment. In fact, it’s usually quite the opposite – maybe you’re struggling with a severe toothache the day before leaving on a much-deserved vacation, or your spouse has badly cracked a tooth while rushing to work. Whatever the circumstances are, the Dental Dynamics team is here to help without delay. With four highly experienced doctors on-staff, a wide spectrum of advanced services are available here for repairing, rejuvenating, and even replacing teeth as needed. Better yet, we strive to make time for emergency appointments on the same day as your initial call! Why Choose Dental Dynamics for Emergency Dentistry? Already having a trusted dental team standing by for dire situations can make a world of difference for panicked patients and families. That’s why Dr. Davidson has brought the specialists to YOU instead of the other way around – our top goal is to offer truly comprehensive care that doesn’t require time-consuming trips to other practices. With the help of our oral surgeon Dr. Katsnelson and our periodontist Dr. Yousuf, even catastrophic situations like severe tooth loss or complex extractions can be expertly handled in our hi-tech office setting with comfort, compassion, and outstanding clinical skill. If the tooth is fully dislodged, try to place it carefully back into its original socket. Alternatively, storing it in a container of milk is a good alternative. The goal is to keep it as moist as possible. If big pieces of a tooth have come loose, gather them up as well and plan to bring them with you. Facial swelling is likely to occur in these situations. The use of a cold compress held against the appropriate cheek can help keep it under control. 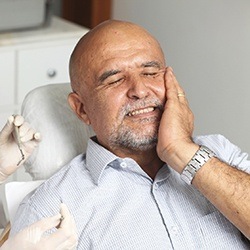 If patients aren’t brushing and flossing as diligently as they should, minor instances of oral discomfort can quickly grow into severe dental sensitivity and outright pain. These symptoms will typically require root canal therapy if the patient hopes to preserve the tooth’s wellbeing. In the meantime, we recommend taking a painkiller like Aspirin to help manage discomfort – although DON’T place it directly on the gum tissue, as this may cause a burning sensation. Toothaches may be caused by a piece of food or debris that’s become lodged against the gum tissue. Try flossing & rinsing thoroughly to see if this is the case. If the pain persists, don’t hesitate to contact our Skokie office right away. Root canals may have a “scary” reputation, but the truth is a big relief. 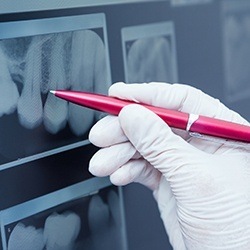 Most patients incorrectly associate the pain of advanced dental infection with this procedure, but it’s actually treating the issue at its core and helping you maintain the natural tooth for many more years to come. 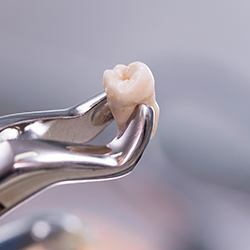 Our dentists will use special instruments to remove harmful bacteria and diseased pulp from within the canal(s), filling the space with a biocompatible substitute before sealing the structure. All in all, root canal therapy has an overall success rate of over 95%! Tooth extraction isn’t a service that any patient particularly wants, and the same can be said for our dentists. We’ll always strive to help patients maintain natural teeth for life, exhausting all possible alternatives before coming to this option. 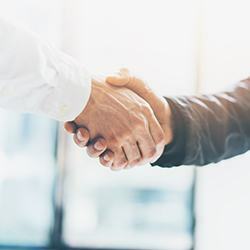 Unfortunately, there are situations where it’s the right path forward for protecting a person’s wellbeing and preventing further harm, such as when advanced injuries or severe infections occur. Our in-house oral surgeon Dr. Katsnelson can handle simple and complex extractions alike, taking care to keep patients genuinely comfortable and at ease throughout the experience. 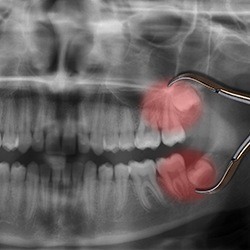 The third molars are referred to as “wisdom teeth” because they typically emerge into a patient’s mouth between the ages of 16 and 22, which tend to be associated with a newfound maturity. Unfortunately, this occasion is often not a happy one. 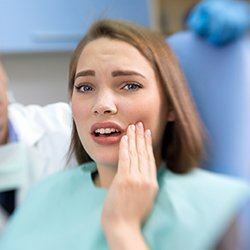 Because there’s so little space left in the mouth, wisdom teeth are extremely likely to become impacted (trapped in the jawbone), leading to higher risks of infection, overcrowding, and even the development of abscesses. Our dentists will use state-of-the-art diagnostic X-rays to keep a close eye on these developing teeth in younger patients, recommending extraction as needed to keep them safe from future harm.